The TRC report is a good chance for you all to save Liberia from this unwanted night mare that continues to threaten our survival as a people as well as our very existence as a civilized nation. The TRC report stands as a resurrecting pillar of our failed state (Liberia). If followed through, this pillar will uphold justice and truth for all Liberians. You all will agree with me that the TRC final report contains more than just accounts against perpetrators; the TRC’s final report has given a complete picture of the gross human rights violations that occurred as a result of the horrible conflict that ripped our country apart. The TRC final report is a synthesized document, a shared history if you will, that can allow us to have a deep understanding of our past; it gives insight into the perspectives of those who supported the destruction of our country and took the lives of so many as well as those who were victims in one way or another who have been left to tell our story. The TRC final recommendations about reconciliation, rehabilitation, justice, and reparation purposely minimized the magnitude of crimes committed during the war by some of our current leaders, in an effort to open the door of acceptance to the implementation of the TRC. Yet, some of our current leaders have refused to move forward with the TRC’s recommendations, choosing greed and pride over national interests. Of course, this attitude got Liberia in this mess in the first place. Implementing the TRC’s recommendation is the only step our President can take to prove to the Liberian people that she puts the country first above everything else. Unfortunately, she is instead inciting the Liberian populace to come against the TRC report as well as refuse to honor it in its entirety. This is in stark contrast to what she alluded to at the inception of the TRC, which was that she whole heartedly supported its establishment, its continuity, and even suggested that she would respect the recommendations and implementation. Since the TRC’s recommendations would exclude her from Liberian politics, it is now considered by her and her administration unacceptable, and against the peace and stability of Liberia. The TRC report would not destabilize Liberia, the act of not implementing it will. The TRC offers very specific guidance on how to stabilize our nation through truth, justice, and reconciliation instead of retaliation. The TRC report outlines ways in which we can cultivate a culture of human rights and build structures to ensure that the atrocities of the past do not reoccur. It also stresses the importance of healing as a nation through continued dialogue in an attempt to create one history and deter people from expressing their pain through violence. Great men of Liberia, now that the TRC has done its part, we must ensure it is implemented. It is up to all of us, but mostly you, the elders and politicians who are in the spot light of national politics. Your role is critical to the future of Liberia. It would be on your shoulders, should Liberia slip into the abyss of total destruction because of your refusal to work together for the common good. One thing you are able to do as a group is to move people to action, but unless you first unite and move them with emotion, they won’t move at all. Once you have captured their hearts, you will have captured their minds. But you as leaders must have a stronger relationship and connection with one another. Which of you will be the first to step forward and take responsibility for the future of Liberia? I challenge each and every one of you to start a dialogue with your fellow politicians as well your fellow countrymen. Liberia’s capacity to achieve its greatness will be determined by your abilities to unite, connect, and empower your people to act for their own good. Robert Goisueta writes, “One thing you must all know is that leadership is one of the things you cannot delegate. You either exercise it, or you abdicate it.” All of you are great leaders; therefore, I challenge you all to exercise your leadership by working together. Just as in sports, a coach needs a team of good players to win, a country needs a team of good leaders to succeed. There are some who are very upset by the TRC report. Some sought to discredit it even before it was released to the public. They should not be allowed to succeed. They are aware that their points are meaningless, but until we stand up and remain steadfast in making sure that the TRC report is honored and implemented, they will continue to fight for the contrary. They will continue to test our courage to fight in favor of the TRC final report. Fellow Liberians, let us accept the final report of the TRC as the way, an indispensable way, to healing our land, our people, and to bring unity and reconciliation, thereby casting off the shackles of history. However, there are obstacles that must be overcome in order for progress to be made. Politicians must not seek to aggrandize themselves by claiming that only they know the solution to Liberia’s immense problems. The problem in Liberia is compound complex and needs more than one head to come up with durable solutions. You all continue to say the same thing over and over without any action thought or mention of collective action. It holds no weight if you individually support the TRC report. Your power comes from your collective support of the TRC report. Why have you all not come together to draft a document in support of the TRC report? Who do we look to if not you? The war scattered us as a people and we look to you to reunite us as a nation and as a political force, for the people are the government, are they not? The world will respect such a document because it represents the voice of the people. But if hundreds of you run to congress everyday saying the same thing over and over, it becomes very difficult for even the US to work with any of you because you have not streamlined into one entity. The US Congress is not a branch of the Liberian government, and we must make it as easy as possible to understand the true plight of Liberia and to assist us. Do not allow your individual political ideologies or affiliations overshadow the pressing issues at hand. Power cupidity will not solve the problems in Liberia. You all cry corruption, hardship, embezzlement, and the lack of rule of law in Liberia. But all of you continue to refuse to work together to solve these problems that are affecting the Liberian people. Will you not step up to rescue this drowning nation? I hope this letter will serve as a conduit through which you all will be moved and decide to work together for the sake of the restoration of peace, reconciliation, justice and stability in Liberia. If there was ever a time in history that begged for you all to work together, it is now for Liberia is in grave danger! I hope to hear from you all as soon as possible. There is a limitless untapped potential of young people living in Liberia. The problem remains the unwillingness of government institutions, corporations, and policy-makers to recognize such potential. And this is a Major challenge preventing Liberian youths from reaching their full potential. Relevant institutions in Liberia must proactively realize the potential of young people if the structures and problems that are keeping youth unemployment rates high must be quenched. The lack of decent jobs resulting from lack of contemporary career educational opportunities is a major contributing factor to youth unemployment, and this is by all means a key source of social and political upheaval in Liberia today. Multitudes of young people are jobless, poor, school dropouts, and uneducated, but they are all demanding their rights and greater voice in economic and political life. There is a need to support initiatives that encourage social contracts that buttress job-rich economic growth. Liberia must make youth Empowerment a priority. Government must focus on more and better jobs for young people. Government must be willing to give Big businesses that operate in Liberia tax breaks, and other incentives. This will pave a way for companies to offer jobs, tuitions, and other forms of stipends to young people in Liberia. Also, Practical discussions on how collaboration among government institutions, social partners, the private sector and young people themselves can be maximized to increase employment must be encouraged. The need to inspire Young entrepreneurs must be prioritized in Liberia. As potential natural resources that enhance economic growths in Liberia are finite and continue to deplete day by day, Government must give tax breaks to companies whose operations are bent on going green. Government must also encourage green educational career among young Liberians pursuing education at all levels. Green career is the way forward. Technological innovations by means of Green oriented initiatives come from accessible local resources. And such resources are availably abundant in Liberia. In fact, they are environmentally save, renewable in nature, and durable if used pragmatically. The Liberian government must encourage the use of new but green technologies in school curriculums so that young Liberians would be exposed to the idea of “Going Green” at an earlier stage in their pursuit of education. Government can realize this potential if policy-makers become more aware that the pillows of any successful country rest on government’s support of the potential of the youths to pursue their dreams. Lastly, government must strengthen human capital in green educational endeavors as well as open up non-rigid labor markets that guarantee youth employment. Without economic growth, getting young people to work is a complete illusion because there will be no new jobs as more and more people are born. Reinventing government’s monetary policy that focuses on youth unemployment cannot be over emphasized at this time. Also, an accompanied durable solution that alleviates youth unemployment in any country is regional collaboration. Regardless of individual economic strength, West African countries, especially Mono River countries must realize the potential of young people and be willing to work together innovatively to solve the long-standing problems of youth joblessness. Once the realization and support of youth potential is there, government and policy markers can now focus on the willingness aspect and target those structures that perpetuate unemployment thereby making the challenge recognizable and the solution attainable. A Liberian female Journalist, Mae Azango, unveiled to the public the hidden sagas of the deepest and most forbidden secrets of the Liberian Grebo bush. She wrote a story about the health implications of female genital cutting within a secret society of women in Liberia. Since the time of publication by the Liberian Newspaper, FrontPage Africa, Mae Azango has lived in fear as a result of threatening messages she received from anonymous callers. Mae fled for her life and is now in hiding. Most interestingly Mae experienced these threats and went into hiding under the watchful eyes of the person she emulates the most, her role model, the one she had looked up to for redemption for years. The one who claims to have advocated for the rights of Liberian women for decades, the iron lady of Liberia, Africa's first female President, President Ellen Johnson-Sirleaf. Mae Azango hasn't slept in her own bed, or seen her 9-year-old daughter, in weeks. She has been living in fear since March 8, 2012. While in hiding, Mae questions why her role model has not come to her aid? Friends visit her under darkness and take with them Liberian newspapers for her to read. She read about her role model's children and how most of them were appointed to top positions in their mother's government. Mae read about nepotism in government, but most embarrassingly the Liberian President justifying why the President's children and relatives should hold top position in government. She read about one of the President's son's grand-style birthday celebration. But there she is, in hiding without her only daughter who has just turned 9 and who's birthday she may not celebrate this year or not for a while. Mae's cry for justice has reached us and that is why we at "Operation We Care for Liberia" feel morally obligated to act without delay. We see the threatening of any journalist's life in Liberia as a jarring reminder of the senseless harassment faced by the press community in that part of the world. While investigations are still going on, the human right community owes Mae Azango, and all journalist victims who suffer harassment from both government authorities and organized criminal organizations in Liberia protection. We demand that justice for Mae is served in a timely manner. We call on all human rights organizations to support our effort in pressuring the Liberian government to provide bodily protection for Mae Azango. Mae should not be separated from her daughter as a result of Government's failure to protect her. Also we condemn the Liberian government for abusing the rights of a 9-year-old child in time of crisis. The Liberian government has failed to respect the United Nations Child Protection act. If the mother of a 9 year old is in hiding for life threatening reasons, it does not require a rocket scientist to deduce that the child's wellbeing is also threatened. Let us put aside the fact that Ellen Johnson-Sirleaf has won accolades and admiration from the international community for her "work and advocacy" on women's rights. Let us put aside the fact that as an advocate, we should expect Sirleaf to call upon Mae to assist her in educating and addressing the very issues Mae brought to light. The issues of Sirleaf's inaction around women's rights are secondary to the issue of preserving human rights, independent of gender. We call upon Ellen Johnson-Sirleaf to protect a person who put their life on the line for the greater good of humanity. We call upon Ellen Johnson-Sirleaf to take Mae Azango's report as a top priority than to allow Mae to be bullied into silence. The silence has been allowed for far too long. Liberia: Agents of DEATH himself they too must encounter. Even, with her Controversy win at the polls, Ellen Johnson-Sirleaf could not and has not revive Liberia as president because like other Liberian warlords, this “Nobel price winner” is in large part responsible for the cold-blooded murders of tens of thousands of defenseless civilians. Considering this fact, it is unlikely that justice would be served in Liberia on Ellen Johnson-Sirleaf’s watch. Gripped with fear and grasping for straws, the Liberian people allowed Charles Taylor to become president. As everyone well knows, this only prolonged the misery. And regardless the level of Ellen’s contribution to the mayhem, her association with Charles Taylor has never been in doubt. That said; didn’t Liberians again grasp for straws by electing Ellen Johnson-Sirleaf as the president? Why would anyone believe that a person so closely associated with Charles Taylor would be right to heal this nation? The people of Liberia know full well Charles Taylor and Ellen Johnson Sirleaf are directly responsible for the rapes, torture, maiming and murders of more than 200,000 of our friends and loved ones. Yet Ellen has shown no contrition, compunction or remorse for her contribution, often downplaying the severity of this awful tragedy. Therefore, both these individuals are unacceptable as leaders or role models and must not be rewarded for their crimes. The people of Liberia rejected Charles Taylor primarily because he murdered our fellow compatriots and wrecked the country’s entire infrastructure. This explains why in the fourth year of his presidency, he finally faced the people’s wrath, barely escaping alive. The Liberian people must also bring Ellen Johnson-Sirleaf to justice because she financed the brutal war that destroyed a generation, impoverished the entire population, decimated families, and turned Liberians into refugees and beggars. Ordering the NPFL rebels to bomb the residents of Monrovia when thousands of civilians comprising of dominantly women and children is unpardonable. The question now is not if, but when will Ellen face the wrath of the Liberian people? Though the date may be unknown, the emotions are certain. OPERATION WE CARE FOR LIBERIA WANTS A “REFERENDUM-FREE SPECIAL ELECTIONS”! Due to the nature of the prevailing political circumstance in Liberia surrounding the residency clause requirement stipulated in the constitution of Liberia for persons wanting to run for the presidency, and given the status of Liberia’s economy and others factors that have the propensity to evoke unimaginable chaos; we call upon all Human right groups, the International community, the Liberian government through its Supreme Court, the NEC Elections commission of Liberia, Senators and representatives of various counties and districts, elders and Zoes, as well as all peace loving Liberians wherever they may reside, to declare the 2011 elections (referendum –free), as such “SPECIAL ELECTIONS” taking the TRC final recommendations into serious consideration in the interest peace. Electronically communicated information should always be checked thoroughly before reaching any conclusion regarding an allegation against anybody. E-mails, websites, video and tape recordings, etc, must be properly examined by the Liberian government or any government before any conclusion can be made on critical issues such as charging a citizen with treason. In these tough times in the history of Grand Gedeh County, as they undoubtedly were from time to time since our existence as a county, but as they increasingly got in most parts of the county when our expectations were very high in hopes of a brand new day between 1980 and 1989, our hopes were dwindled before our very eyes between the two years as a result of dominantly administrative blunder on the part of those who were steering the wheels of the country. Their failure to make a paradigm shift in attitudes and judgments has brought us where we find ourselves as a people today. I have pieced together what I think as a civilized person, and what other civilized people think should happen in order to protect the United States of America from people like Faisal Shahzad who tried to blow up an SUV in Times Square Saturday evening in New York. I read in the news that the US government is now requiring airlines to check no-fly lists within two hours of being notified of list updates — a move aimed at preventing known terrorist suspects from boarding airplanes — as the man accused in the Times Square bombing did. 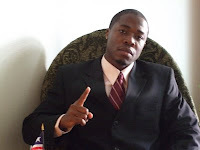 Liberia: Operation We Care for Liberia calls on President Obama to step in!